. . . no small feet: wait, whose fault is it? Coach's birthday was Thursday, November 15th. It was posted on the huge dry erase board . . . the one that STILL isn't hidden by the barn doors because lousy contractor #2 is, well, lousy. The kids KNEW about the birthday. Um, they just forgot. Since it was a Thursday, the birthday boy was home, briefly- in the morning. I wished him a happy birthday before I hopped in the shower. Kids start to get dropped off here around 7 am sharp, so not a lot of down time. I don't attend a crazy early workout class on Thursday mornings, so I had not set foot downstairs until after my shower. When I came downstairs about 10 minutes after Coach, the three high school kids were in various stages of getting ready for school. Tank wanted to get to school early, and Coach had agreed to drop him off on his way to workout before he started to see patients. to my hand? Gi-normous by my standards. Tank is almost never ready for school on time, so it is something of a small miracle when he gets himself ready early. 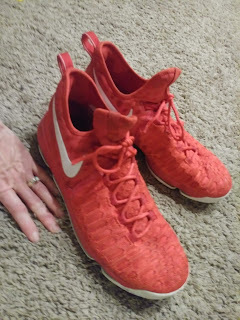 Of course he texted me later to say that he forgot his red basketball shoes - how can you forget something so gi-normous? And he wanted me to bring him a signed permission slip that I swear isn't due for a week, but I was happy to clear it off my counter. I texted him back that I would bring requested items, but that I would be charging him a $10 delivery fee today and every day in the future. Get organized, damn it. I also pointed out that had I not been planning to attend library story time at the library directly across the street from the high school, then I would not in a million years be hauling 6 kiddies in the car just to deliver his forgotten stuff. Ed's mouth fell open. Yes, there was food in it. Mini's hair was still in a towel, she was making her lunch. She cringed. Tank groaned. I have no idea what Tank was doing but he must have been productive because he and Coach were about to leave. Tank typically needs someone to stand next to him and shout 'stop messing with the babies, get some socks on, what do you want in your lunch since I am sure you are not making it yourself!' I think he was going in early to review for an AP Euro test. This is the only class he cares about. He actually tries hard in it, because he LOVES history. The other classes, well - let's not go there. Coach reappeared in the kitchen and our high school nit-wits wished him a happy birthday. After Coach dropped Tank at school, he forwarded me a text that Tank had sent him. Not mom's...those kids are old enough to read AND they've been in the family long enough to know when birthday's are. My point EXACTLY! Of course, Tank's text made us laugh. My birthday is over Christmas break. No one racing off to school. No excuses. They had better remember! If your husband is anything like mine, he probably didn't care at all! I hope he had a happy birthday!